With the controversy over gay marriages grabbing national headlines, traditional conceptions of family in American society have become subject to increasingly fierce debate. 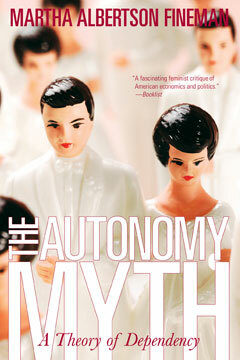 In The Autonomy Myth, influential and always provocative legal theorist Martha Albertson Fineman expands the terms of the debate even further to argue for public policy that reflects the realities of how we live together. As Fineman points out, those charged with administering U.S. social policy have long considered the marital family household as both separate and self-sufficient, often at the cost of the well-being of many families and their members, especially children. Vigorously taking issue with this approach, Fineman makes the compelling case that the sexually affiliated couple is not the appropriate building block for contemporary families. Instead, she argues, society should be organized around “caretaking relationships,” particularly those involving children or elderly dependents. In this paradigm-shifting book Fineman insists that, because each of us is “inevitably dependent” at various stages in our lives, it makes far more sense for us to recognize from the outset that society as a whole has a vital role to play in providing assistance.